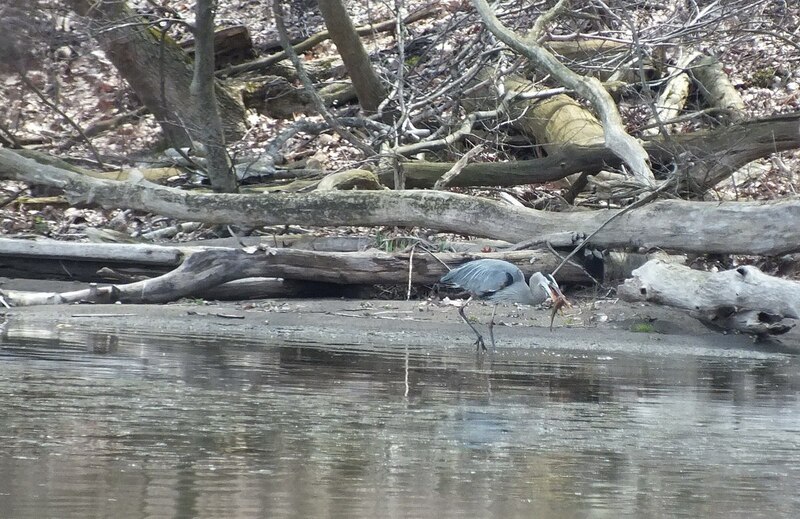 On a visit to Cootes Paradise Marsh in Hamilton, Ontario we sighted two Great Blue Herons out in the water, obviously on the lookout for a fish to catch. 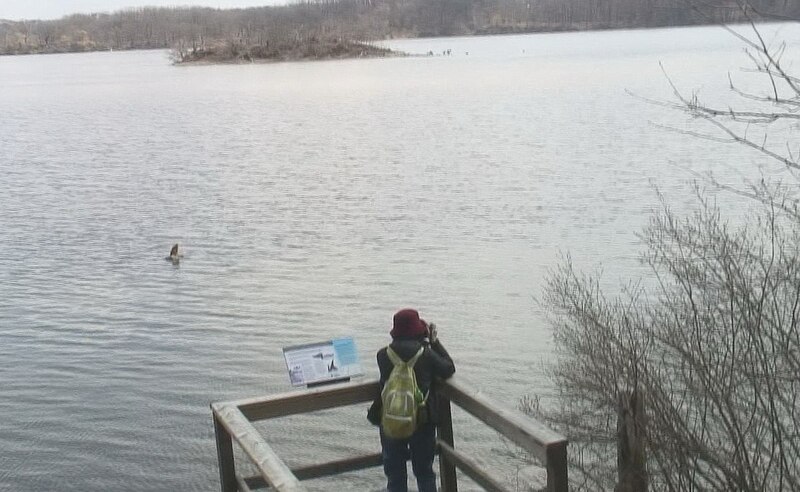 Cootes Paradise Marsh is the largest wetland at the western end of Lake Ontario. 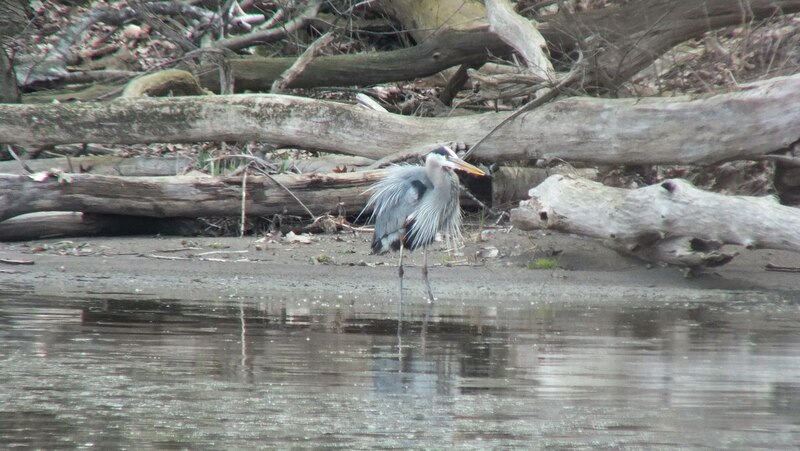 Bob and I paused for a long period of time to enjoy the grace and beauty of the Great Blue Herons. 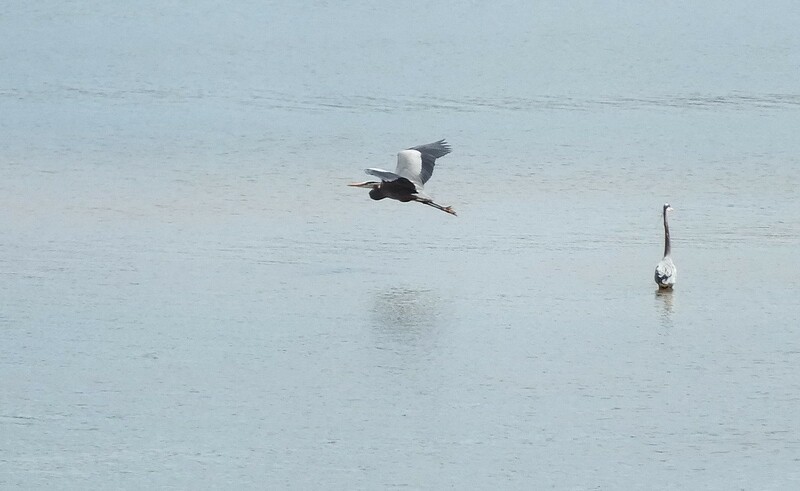 In flight, these herons carry the neck doubled back with the head against the shoulders. 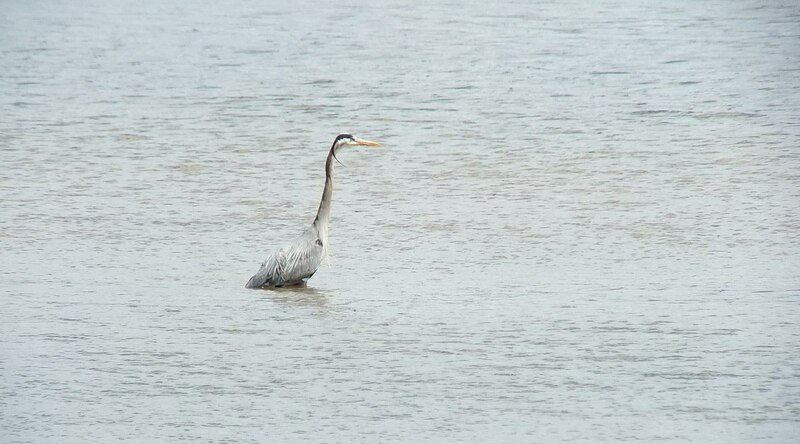 A Great Blue Heron can be anywhere from 36–54 inches long from head to tail and has a wingspan of between 66–79 inches. 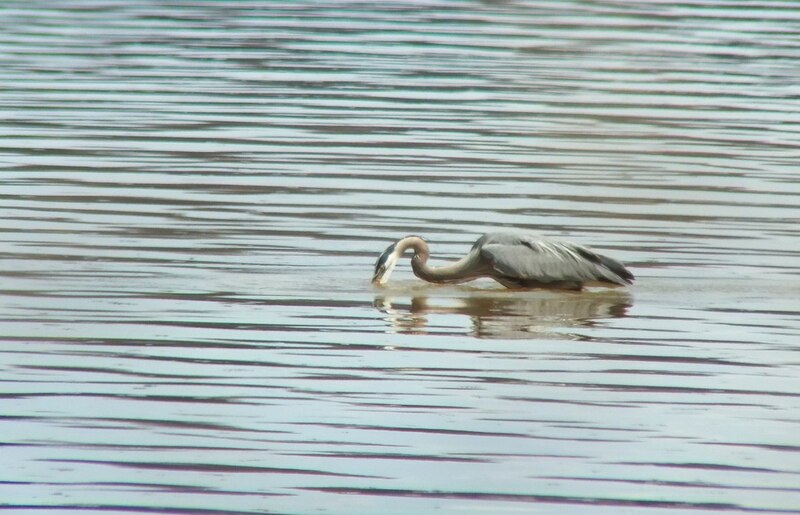 Great Blue Herons feed in and around open shallow water, and while we watched, no less than three of these birds arrived on the scene. We figured there must be good fishing in the bay. 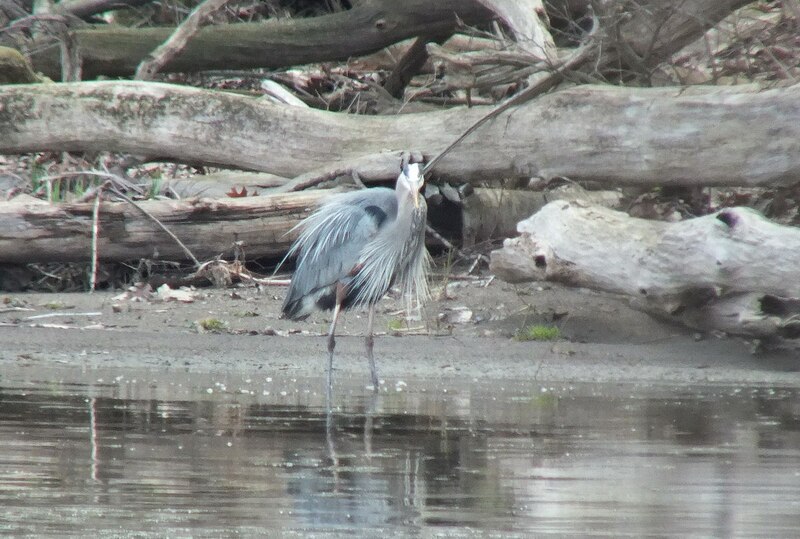 Great Blue Herons are solitary feeders, nonetheless. The most commonly employed hunting technique of the species is to wade slowly with its long legs through shallow water and quickly spear fish or frogs with its long, sharp bill. Further along the trail, Bob and I located a lookout at Pine Point. 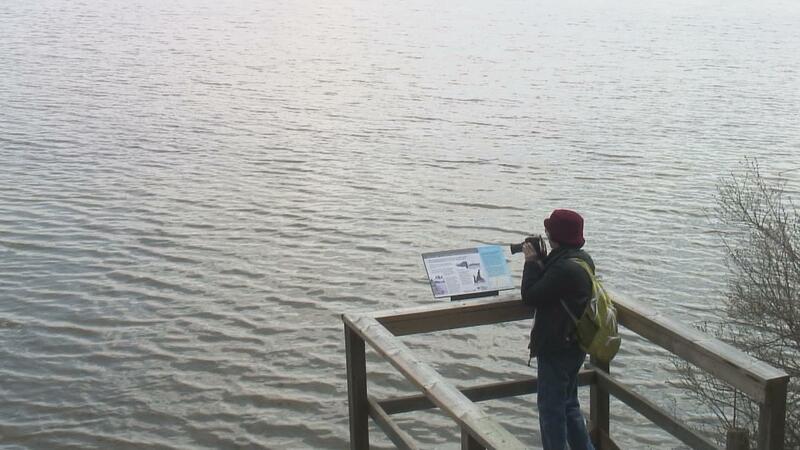 What drew our attention was a raucous splashing of water in the shallows adjacent to the observation deck. 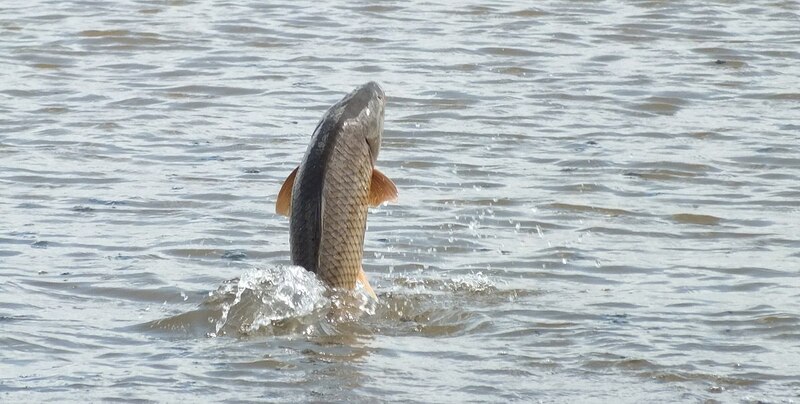 We soon realized that fish were propelling themselves up out of the water over and over again. 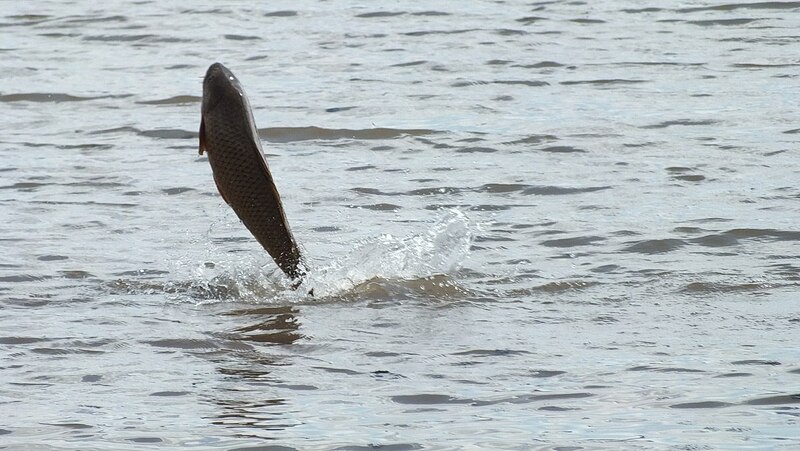 I managed to snap a couple of photos of the air-borne fish, which we believe are Carp. 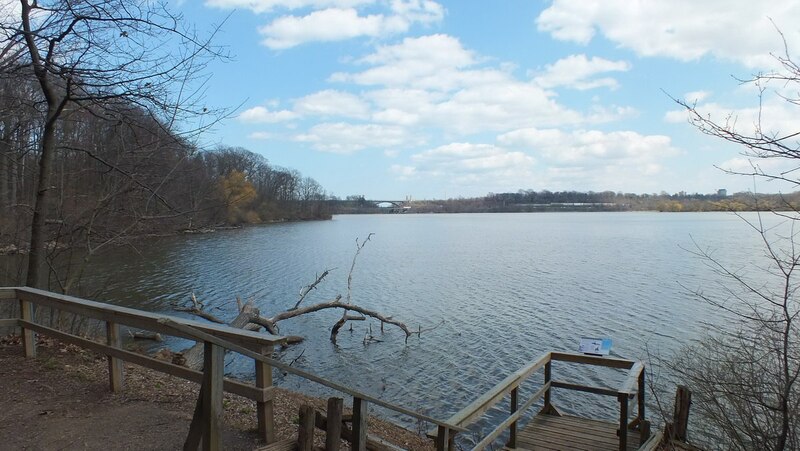 The Royal Botanical Gardens has worked relentlessly to eliminate Carp, an invasive species, from this protected wetland area. 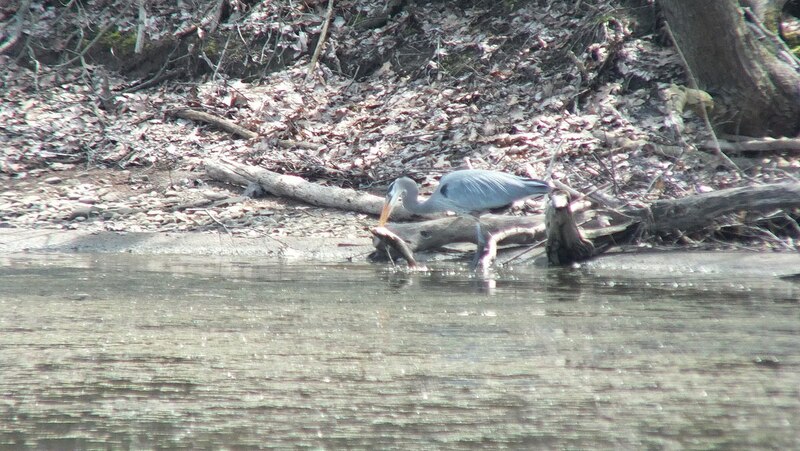 We wondered if it was some of the Carp that the Great Blue Herons were trying to catch. 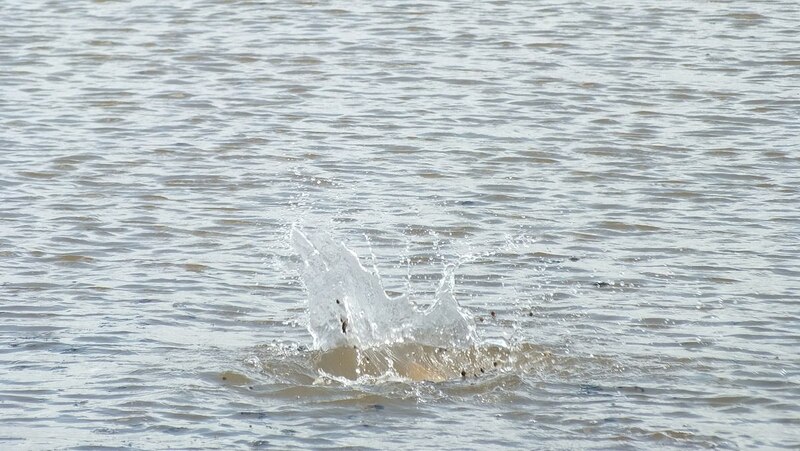 The fish seemed plentiful judging by the continuous jumping and splashing. It was a challenging task, that of capturing the jumping fish on film. I would focus my camera to my left, and sure enough, a fish would jump on my right. If I switched to the right, the fish jumped to my left. In some cases, I was able to predict where a fish might erupt from the water by the turbulence it generated on the surface just before it leapt into the air. The resulting big splash is what drew our attention in the first place. I thought a family of ducks was at play before I saw what was happening. 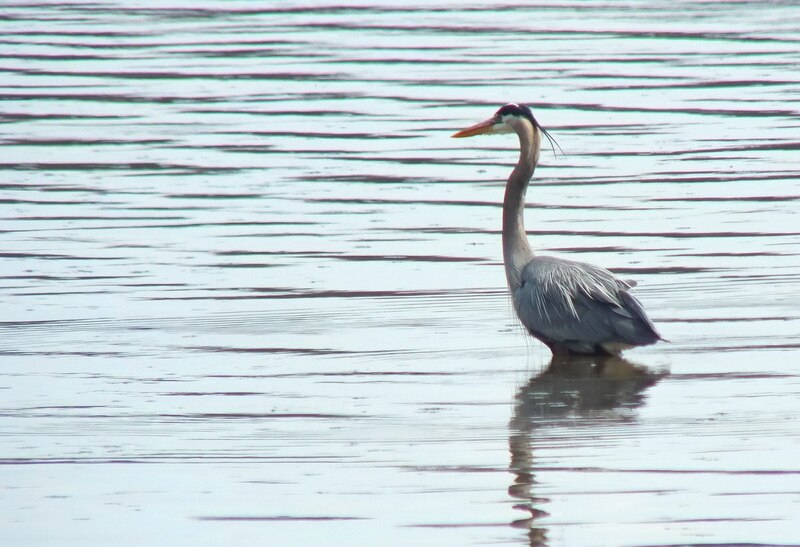 Nearby, the infinite patience of this Great Blue Heron paid off. It had waited until a fish ventured close by, and with a quick thrust of the long neck and the 5-inch long spear-like bill, it captured a fish. 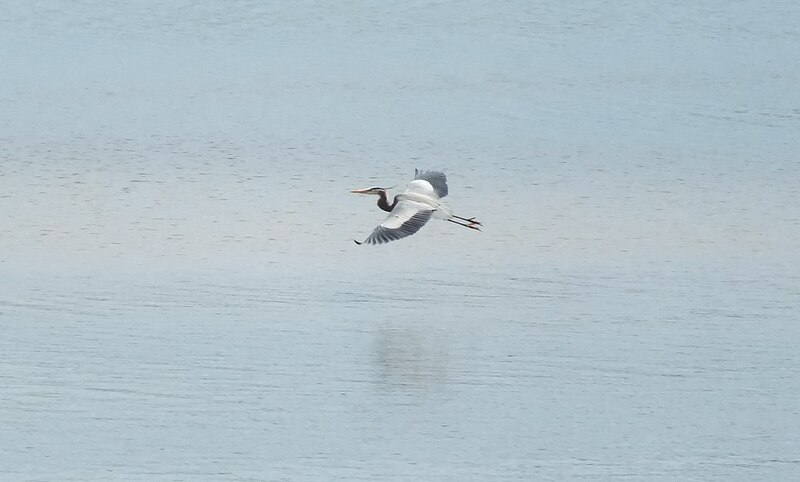 Bob and I were thrilled that the heron moved only a short distance to the shore to eat its catch. We were able to watch the whole process. Great Blue Herons usually swallow their food whole, but in rare instances, they have been known to choke on their prey if it is too large. 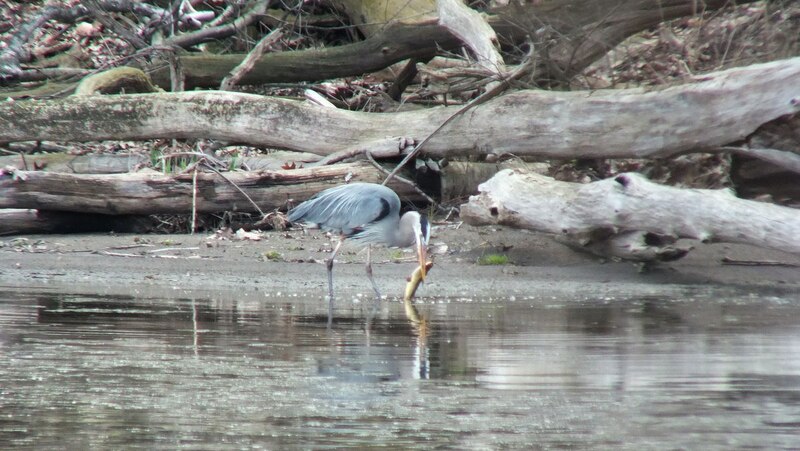 Judging by the size of the fish in this heron’s bill, it was going to require some work to cut it down to size. 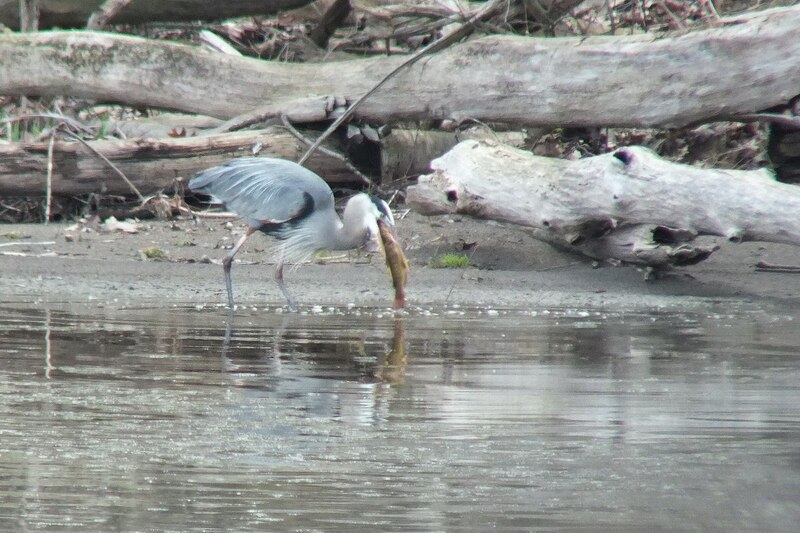 For a good half hour or more, Bob and I marveled as the heron beat this fish up. It tossed it onto the beach, shook it vigorously in its beak, and tugged at it. 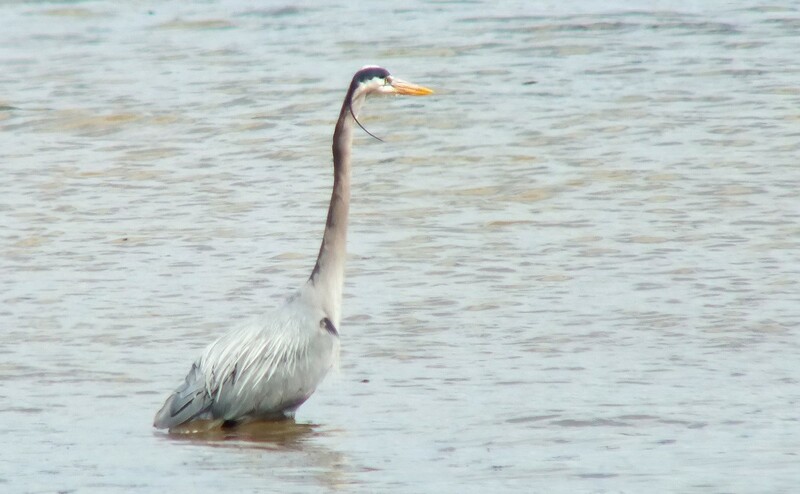 Great Blue Herons also eat frogs, salamanders, water snakes, large insects and small rodents. 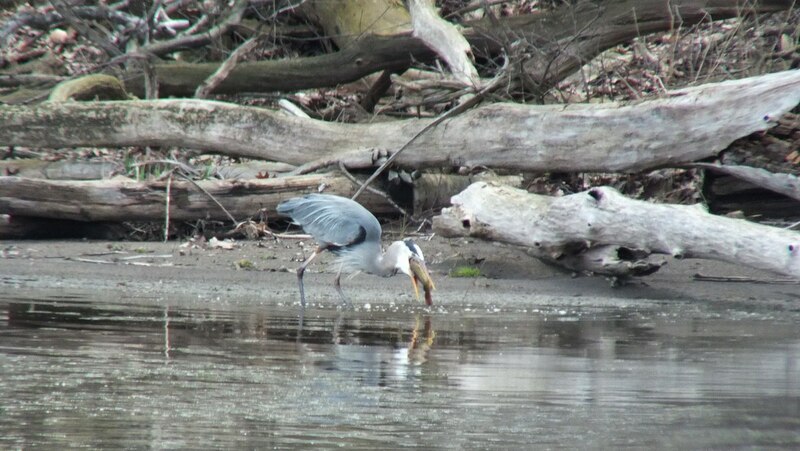 A friend of ours once admired a Great Blue Heron when it perched on her dock for an afternoon, but was shocked to see it scoop up their local “tame” chipmunk. 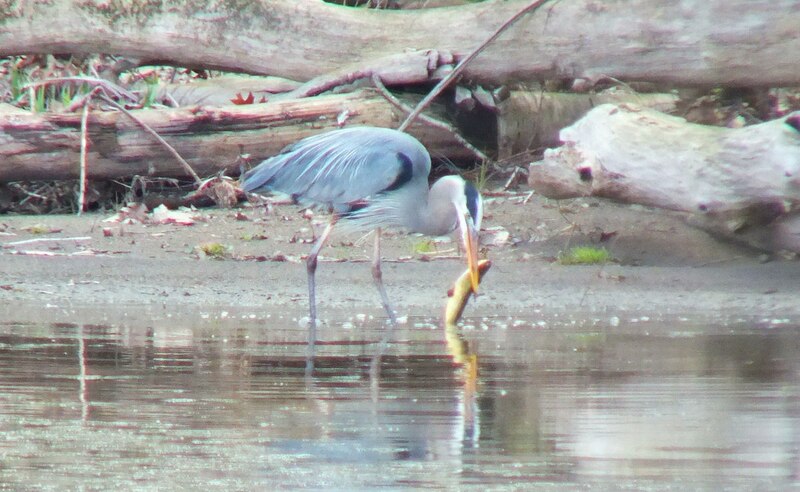 Much time was invested wrangling this large fish, but eventually the heron tried to swallow the fish whole. 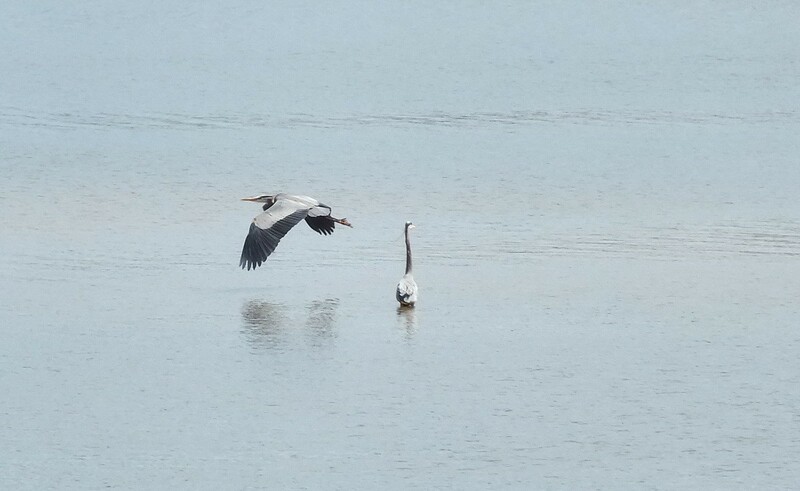 By that time, a second Great Blue Heron had arrived on shore a short distance from the other one. It appeared to be wiling away the afternoon with no food in sight. The feathers on the lower neck of a Great Blue Heron are long and plume-like, but they also have plumes on the lower back at the start of the breeding season. These are visible in my photograph above. 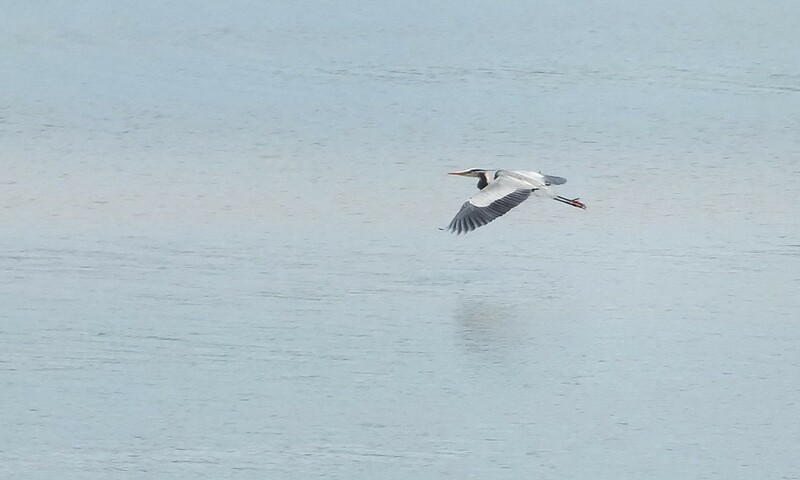 The heron seemed to assume somewhat of a defiant stance, almost as if it was staring me down, but I was hundreds of feet away on the opposite shore of the bay. Great Blue Herons are the largest North American heron and are recognized by the greyish-blue plumage on their upper parts. The distinctive white head has a broad black stripe on either side, extending from above the eye to the nape and projecting behind the head in a slender black crest. You can just make it out in this snapshot. Whether standing motionless or in stately slow-measured flight, Great Blue Herons are among the most picturesque of birds. Thanks, Miriam, for checking out our blog. We are glad that you enjoyed it, and hope that you might take a look at some of our other stories. Great blue herons are universal. They are found on every continent, except Antarctica.